I love me some chalkboard. I was thinking about a bigger one. One that was large and in charge. size chalkboard I was thinking of. I wanted something as a backdrop for my dining table. or maybe a message or quote. and painting a chalkboard on. though it took nearly a whole piece of chalk to finish it. and I can't wait to do the wine list. 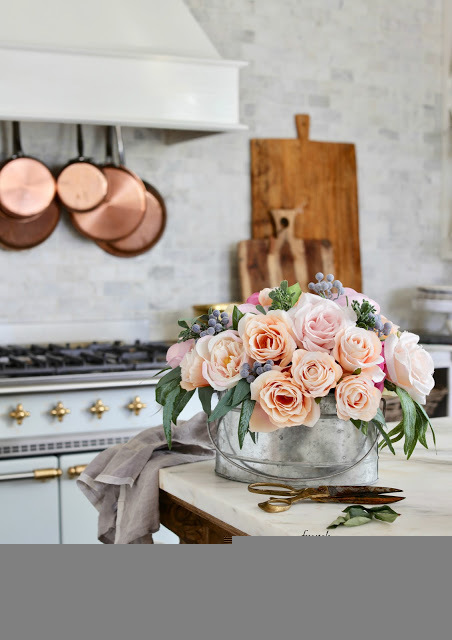 I love the mix of rustic and elegant. and wee cypress tree seedlings on the table. Utterly fantastic! I adore it! Oh Me.. Oh My!!! that is gorgeous... Can I sit in Chair #3 PLEASE!!!!! So SO LOVELY!!! I think your chalkboard creates quite a statement in your dining area Courtney... beautifully done. Gorgeous!! I love this so much! Love, love, love!!! I want one, but don't have a blank wall right by my dining table:( I'm sure i can find a spot somewhere! Inspirational and gorgeous!!! I love it. Can't wait for Feathered Next Friday...getting my vignettes ready! OK, I'm in love with ever element! 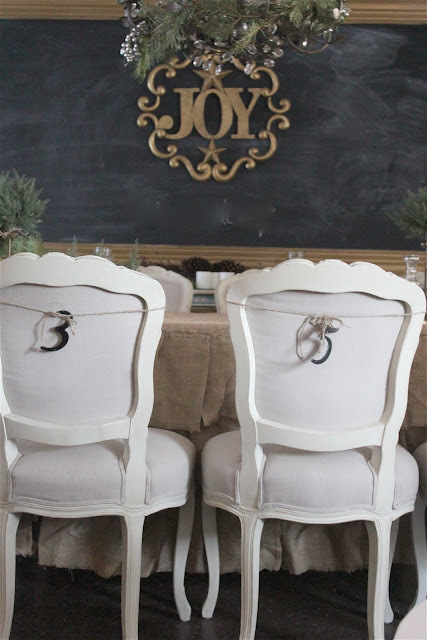 The temporary numbers on the chairs is a fantastic idea and your chalkboard is a great focal point. Awe I love it! Love your style, just gorgeous! Absolutely gorgeous! I love me some chalkboard too! In fact I my refrigerator is chalkboard. I love the idea of it in the dining room. So wonderful! That is just beyond fabulous! Fantastic Courtney. I love the grand scale of it. OMG, Courtney. What a dining room setting! WOW on the chalkboard and I'm lovin' the numbers on the chair backs. This simply fabulous! I love the huge scale of it. The contrast is perfect. Oh, please come and share this with us at "What's It Wednesday", it's just divine! The dining room is fabulous. Great job! That looks beautiful, Courtney! 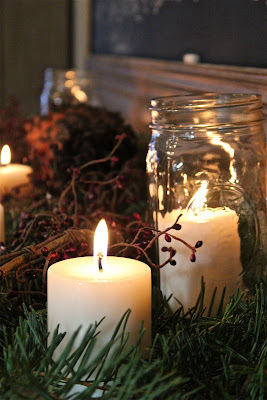 It really makes for a great backdrop to your table! OMGOODNESS!! Courtney this is gorgeous. I have the same chalkboard picture saved but yours is even prettier. Thanks for joining my party. Courtney, I love it!! Thanks for sharing it at wow. 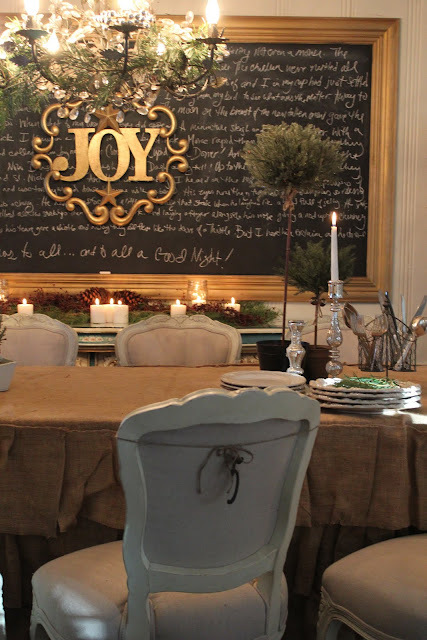 Wow, what a fabulous chalkboard and a beautiful dining room. 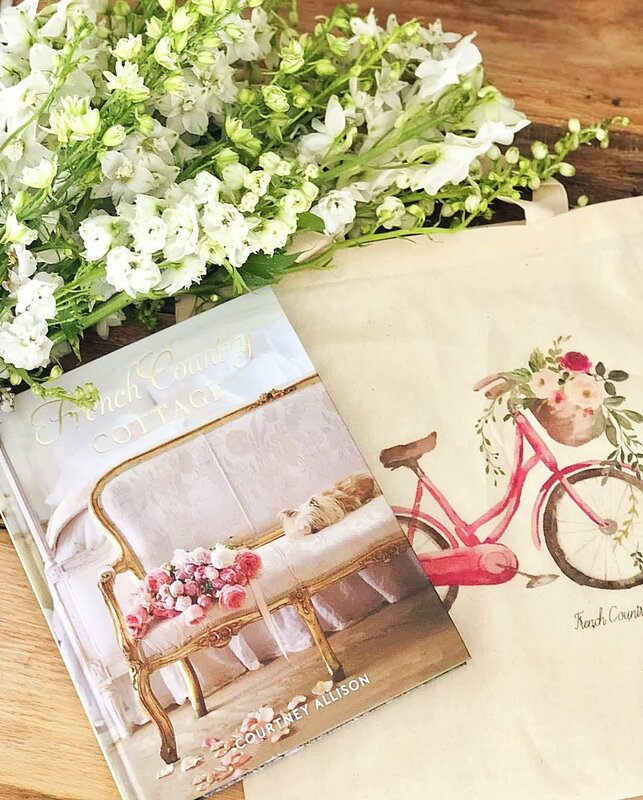 I'm loving the rustic with the elegant also Courtney. It's just gorgeous! Thanks you for sharing with us. Wow! And Yay! Well done! LOVE this Courtney!! Thanx for sharing for THT! Wow! Wow, Wow... Love at first sight. I had a giant antique chalkboard a few years back that I sold and I don't know how many times I've regretted that, now even more. You have the best style. I love your blog. I love chalkboards too! Your dining room is lovely! Thanks for stopping by with your sweet comment. TOTALLY love it Courtney! superb. Awesome! I love your chalkboards. Joy is my favorite word for this season. Joy is a great gift. Beautiful! I love it! Everything looks so gorgeous, the chalk board you made, your burlap tablecloth, the frechy chairs and the wee trees wrapped in burlap. So simple and beautiful! Courtney, this is just gorgeous!! You never disappoint! Love your creativity! This chalkboard is perfect!! There's so much inspiration here! Thanks so much for sharing! Fantastic! It's amazing! I always love your decor. I didn't think you could make it better, but this is fabulous! I LOVE your chalkboard! Just one more place for you to write out all your inspirational quotes. I too, must now have me a chalkboard (or two) (or more)! And if you've ever seen how wordy I am, it's gonna have to be a really big one just like yours! Inspired fasho! ok i have no words. YOu have been hitting it out of the park lately!! This is just super fabulous!!! I love this. Thanks so much for sharing with us at Nifty Thrifty Tuesday. Beautiful! My Grandparents had a chalkboard in their home. Thanks for taking me back to those memories! I am in LOVE!!!! its gorgeous and perfect and I want one!!! dang...I don't have a wall like that!!!! How cool is that! I love me some chalkboards, too. Yours is beautiful. 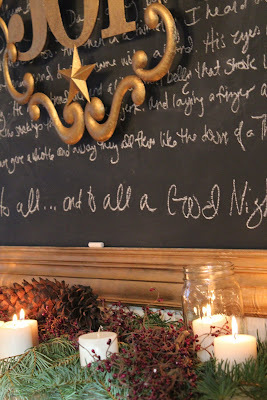 I have always loved the way you incorporate your chalk boards into your rooms. Your dining room is gorgeous!!! I love chalkboards too! Definitely one of my kitchen my must haves! It reminds me of French cafes and restaurant with written signs "Plat du Jour"
Oh my goodness Courtney this is SO AMAZING!!!! 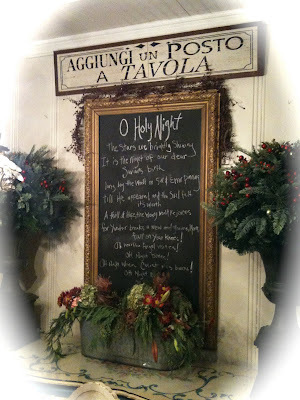 I am in love with the huge chalkboard and paired with the burlap ruffles and the topiary...I just don't have words! It looks over the top GORGEOUS!! om my goodness Courtney, this setting is just too fabulous!!! p.s. did i mention how much i love this??!! LOL!!! Beautiful! Love the size of this board and adore the cypress seedlings on the table! I love chalkboards too! You rock! Hi Courtney! It's amazing and I'm speechless on how beautiful it all looks together! 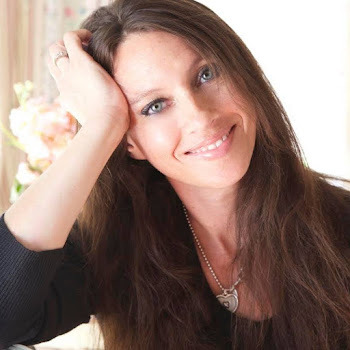 Thanks so much for the feature last week! I really do love this look. You have so much talent. Thanks for sharing all of your wonderful creative ideas. That looks amazing! I love the hugeness of it! What a gorgeous dining room. You have the right size chalk board for your table and dining room! Love it. I am a big plant and greenery fan. Love that, too! And Wow that is your dining table featured on this magazine? I have to check it out! Thank you for letting us party! I love your chalkboards. I had a huge one which I finally found a home for over my bed. Yours are awesome! The one must be huge. I also love the ruffled table cloth/skirt. Courtney, the chalkboard is awesome!!! We've put a few vintage framed chalkboards in our booth, we love them! Very cool! I'm in the process of creating a large, one-of-a-kind chalkboard for my new office...Yours is stunning!!! Okay, you twisted my arm...I gotta make a chalkboard with one of my fancy garage sale frame finds. Thanks for the inspiration! Oh my gosh I LOVE your giant chalkboard!!! I am totally going to do that for my dining room! This looks amazing! Such a statement piece. Nice job! This huge chalkboard behind your table is so awesome!!!!! 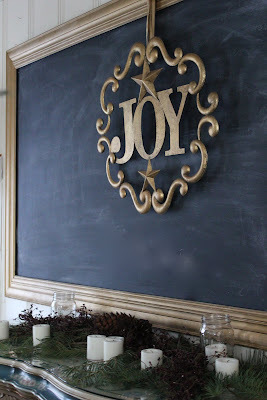 You know I love chalkboards, too:-) I have a really large vintage one I use in my craft room above my table, but love the look in the dining room. So i was wondering how big exactly you bought you plywood and then what were your measurements on the molding? THANKS!!! 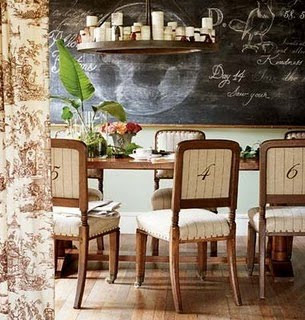 this is just stunning - the chalkboard and that ruffled table skirt are just wonderful! Glad to be perusing and exploring your site! Hi Courtney! Hope your week is going well! Just wanted to let ya know I featured ya on THT! Wow...this is just fabulous. I love all of your chalkboards, but this one really is super special. It is perfect where you placed it. 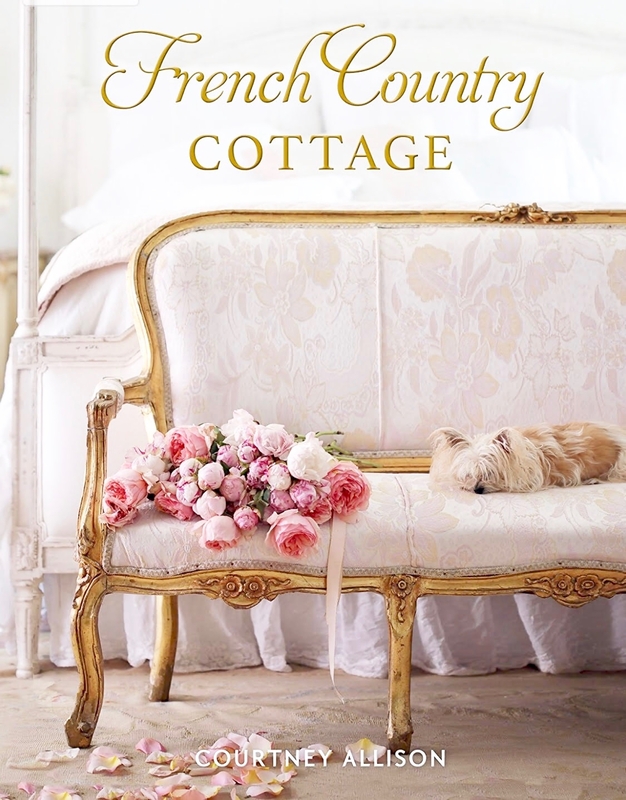 I would love it if you could share this fabulous post at our What's it Wednesday linky party. I hope you can join us. 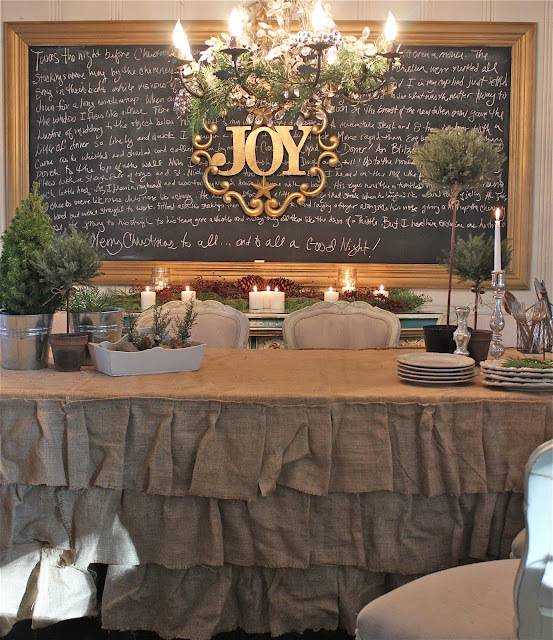 Love the chalkboard and the ruffled burlap table cover! I adore your style! I like the chalkboards that you've created. You're definitely a very creative gal! Love the chalkboards! I have a wonderful frame I've been wanting to add the right twist to and this is perfect! Thanks for the great idea. So glad I found your site. You inspired me so much I did a chalkboard in my kitchen with my recipes on it. Thank you for all your creative ideas. very nice! 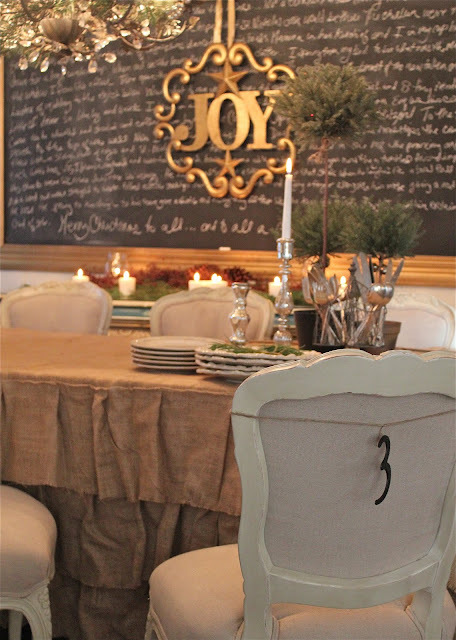 I'm crazy about chalkboards too- in fact, I have the very same photo from a magazine showing the chairs with numbers! Absolutely gorgeous! 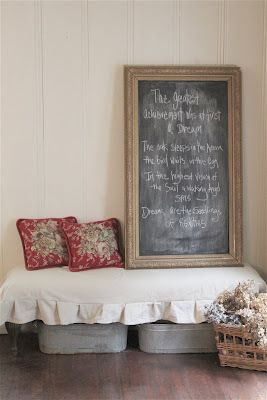 I just featured it in my chalkboard project roundup :) Have a great weekend!